The Political Student | Has Political Correctness Gone too Far? A few weeks back, the University of Massachusetts Amherst held an event tailored to the use of politically correct speech on American campuses. The guests that appeared on stage were there to promote free speech, in the event titled “The Triggering: has Political Correctness Gone too Far?” and shed some light of the “real world” outside of a primarily liberal environment. Instead of being met with cheers, and applauds the guest speakers were instead greeted by a combination of boos, screaming, and even a temper tantrum. In a video now gone viral, a girl is both scene and heard screaming, swearing, and throwing up inappropriate hand gestures. And she is not alone, the protesters continue on throughout the entire hour and a half event. Which leaves the question: has political correctness gone too far? 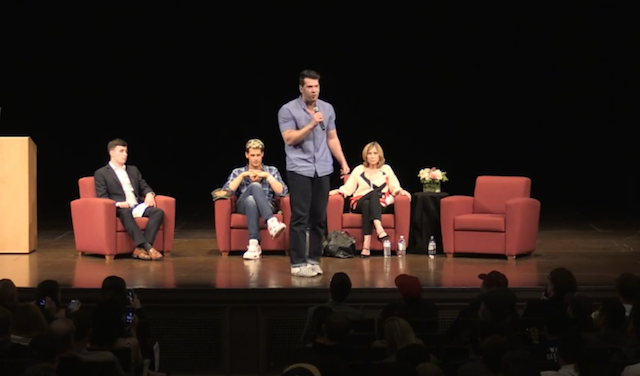 While I do not agree with the positions of the guest speakers- Milo Yiannopoulos, Steven Crowder and Christina Hoff Sommers- I also do not agree with the response of the protesting audience members. Being politically correct is important, but going out of your way to inhibit a guest’s freedom of speech is not the appropriate approach. More importantly, it is not justifiable to ruin an event for those who are genuinely interested in hearing the opinions of others. I am sure there were plenty of audience members who did not agree with what the speakers were saying, however kept to themselves.it seems the activists in the audience that were terrorizing the speakers were further proving the points that the guests were making. The protesters didn’t even let the panel speak before they started antagonizing them, which handed the panel a chance to attack political correctness from the start. The panel was brought to UMass by the school’s republican club, and that was publicly known. Those who would have found their views offensive, should have either stayed away, or kept their comments for the open discussion at the end. It is okay to have a differences in opinions and one can only formulate a real opinion if they hear the opinions of the opposite side. Triggering is a growing fad among millennial college students and this event further proved its existence. While we should be cognizant of the effects that hate speech has on individuals, activists should take a step back and look at the big picture. They are after all, just words. Fighting hate with hate hasn’t solemnly created any real change in the past, and it is doubtful that it will get anything done in the near future. There are other ways to go about causing change within a campus community then throwing temper tantrums, and fits. If one does not wish to have hateful things said to them, then perhaps they should lead by example. The fight for social justice cannot be accomplished by using slander to fight the opposing side. It can be accomplished by peaceful and justifiable means, such as handing out flyers outside of events like these with ideas different from the ones portrayed on stage. The people depicted in the video should not be the face of all who believe in societal reform. Rather, look to the more adult acts of organized protesting and the push for legislature.